Last week, the Democratic-controlled Assembly Housing Committee voted down a bill to repeal the Costa-Hawkins Act. And with committee members like Ed Chau, who represents Monterrey Park, treating the tenant side with contempt, Democrats demonstrated that future legislative action is pointless. “Chau confirmed to allies months ago that he agreed that Costa Hawkins should be repealed. 2. After being lobbied heavily by landlords, he shifted to undecided. 3. For months, he dodged tenant activists including those in his district, refusing to confirm his position or explain any change of heart. 4. In last minute visits between tenant advocates and he and his staff, he refused to state a position and claimed he was driven by “data.” His office couldn’t identify what kind of data would drive his decision. 5. No data whatsoever was referenced by Chau to justify a no vote on 1506, and significant data to rebut the landlord arguments were submitted to Chau. Jim Wood, who represents the North Coast, was the other Democrat who failed to ensure the bill got out of committee. Few thought the Costa Hawkins Act would be repealed this year. The idea was to test the legislative waters for receptivity. Even a one-sided floor vote defeat would put legislators on the record on this critical issue, an important step toward securing a legislative majority. Tenants have a choice. They can be like Charlie Brown and act surprised each year when Lucy pulls away the football. Or they can take matters into their own hands. I wrote about the planned statewide Repeal Costa Hawkins measure last October, (“Will Voters Repeal Costa-Hawkins in 2018?”). Those involved with the measure were not happy with my criticisms, but I was not alone in expressing them. I did not see much hope in winning repeal legislatively. I saw the best strategy as building a statewide legislative campaign for 2018-2019 and then going to the ballot in the presidential election cycle that offers the highest tenant turnout. But a majority of Democrats in the Legislature showed last week that they do not want activists spending the year mobilizing around AB 1506. Instead, they shut down the repeal Costa-Hawkins legislative campaign two weeks into the new year. The Legislature told tenants not to look to Sacramento for repeal. So if landlords want to spend $25-50 million opposing Costa-Hawkins repeal that looks like what they will get. I discussed in my previous article some of the controversy surrounding Michael Weinstein of the AIDS Healthcare Foundation, who has committed millions of dollars to the Repeal Costa Hawkins measure. But after what happened in Sacramento last week I think a lot of tenant activists figure that if Weinstein is willing to put $25 million into a campaign to help tenants, more power to him. The challenge of winning remains steep, but the Legislature has given tenants no alternative. 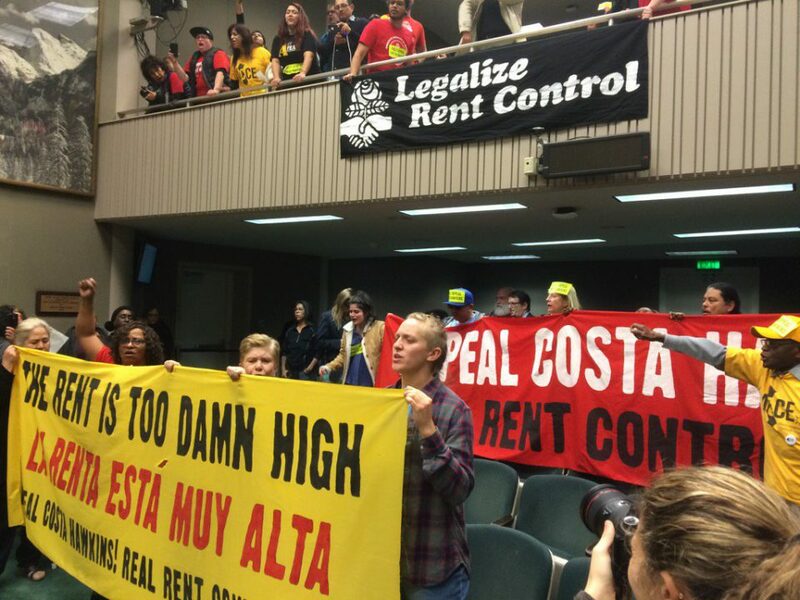 Repealing Costa-Hawkins through a statewide measure is more difficult since so many tenants do not live in rent-controlled jurisdictions. That’s why getting rent control in Sacramento, now subject to steeply rising rents, would really help Costa Hawkins repeal. If Costa Hawkins is to be repealed, voters will have to do it.